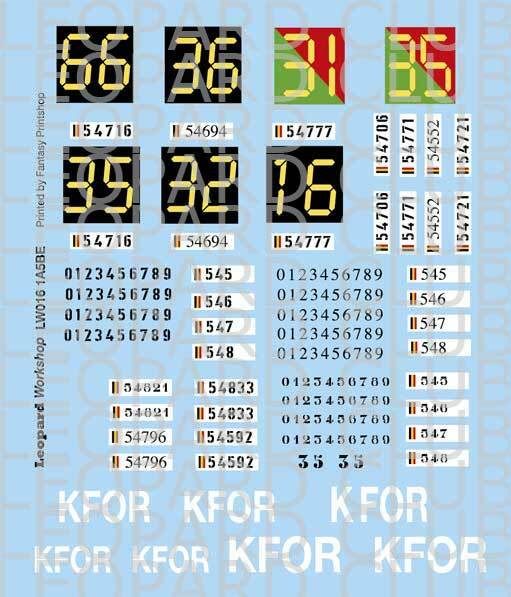 The focus of this sheet of decals is the Leopard 1A5BE which saw service with the Belgian Army from 1994. 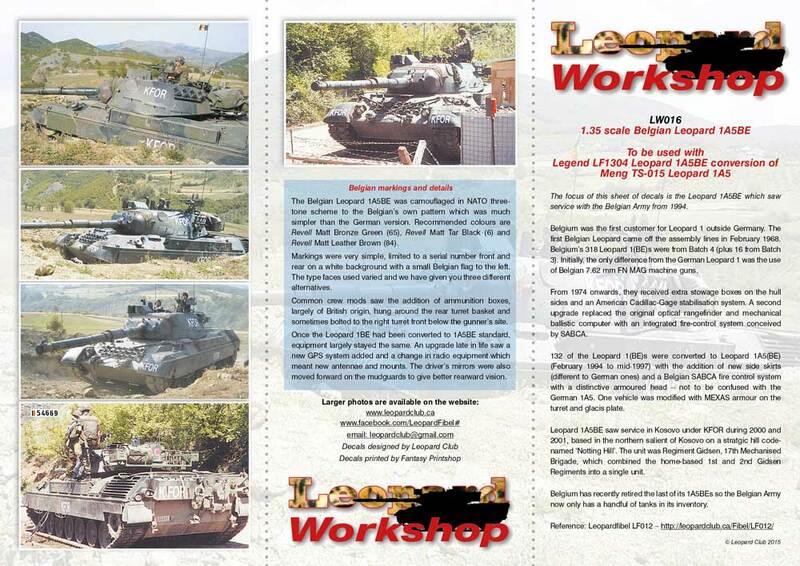 Belgium was the first customer for Leopard 1 outside of Germany. 132 of the original Leopard 1BEs were converted to Leopard 1A5BE (February 1994 to mid-1997) with the addition of new side skirts (different to German ones) and a Belgian SABCA fire control system with a distinctive armoured head - not to be confused with the German 1A5. Leopard 1A5BE saw service in Kosovo under KFOR during 2000 and 2001, based in the northern salient of Kosovo on a strategic hill code-named 'Notting Hill'. The unit was Regiment Gidsen, 17th Mechanised Brigade, which combined the home-based 1st and 2nd Gidsen Regiments into a single unit. 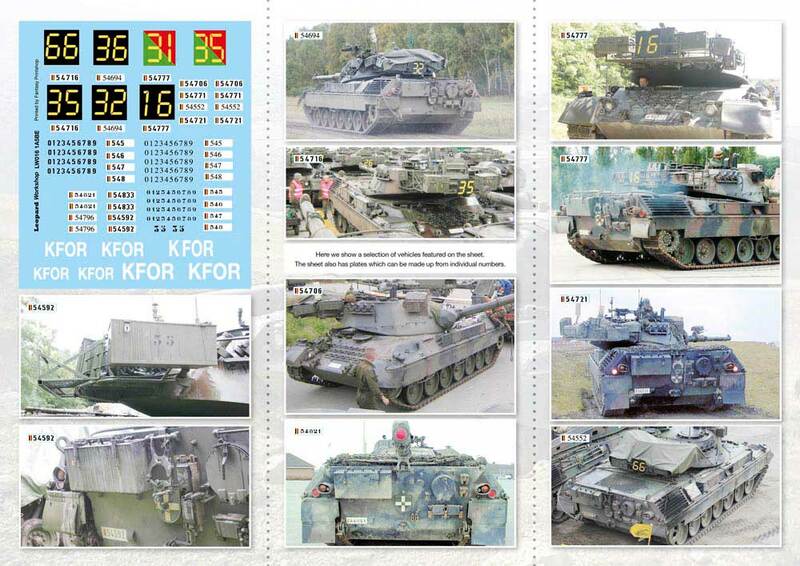 Belgium has recently retired (2015) the last of its 1A5BEs so the Belgian Army now only has a handful of tanks in its inventory. The Belgian Leopard 1A5BE was camouflaged in NATO three-tone scheme to the Belgian's own pattern which was much simpler than the German version. Recommended colours are Revell Matt Bronze Green (65), Revell Matt Tar Black (6) and Revell Matt Leather Brown (84). Markings were very simple, limited to a serial number front and rear on a white background with a small Belgian flag to the left. The type faces used varied and we have given you three different alternatives. Common crew mods saw the addition of ammunition boxes, largely of British origin, hung around the rear turret basket and sometimes bolted to the right turret front below the gunner's site. Once the Leopard 1BE had been converted to 1A5BE standard, equipment largely stayed the same. An upgrade late in life saw a new GPS system added and a change in radio equipment which meant new antennae and mounts. The driver's mirrors were also moved forward on the mudguards to give better rearward vision. Photos by Mark Avonds, Jan Coopman, Pierre Delattre, Roel Gutjens, Sebastian Kreutzkamp and Peter van Iren.